Australian police are warning people not to rely on Apple’s new mobile mapping application after several motorists ended up in a semi-arid national park where temperatures can reach 115F (46C) and there is no water supply. Australian police are warning people not to rely on Apple's new mobile mapping application after several motorists trying to find Mildura, Victoria, (denoted by the purple pin) ended up in a semi-arid national park (denoted by the red pin). Police in the town of Mildura, which is the Australian state of Victoria, issued a news release on Monday saying they’ve responded to several drivers who became stranded in Murray Sunset National Park. Apple’s Maps application, introduced in iOS 6, shows Mildura near part of the park when it is actually located about 44 miles (70 km) to the northeast, according to police. Some motorists have been stranded for a day without food or water, walking long distances through dangerous terrain to get phone reception, police said. Police, who called the problem a “potentially life-threatening issue,” said they have contacted Apple and advised that people use other mapping programs until Apple’s program is fixed. 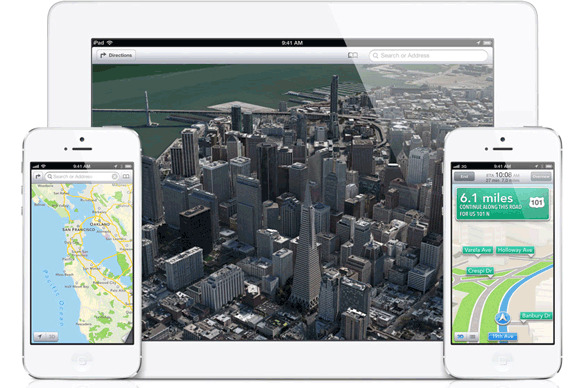 Apple replaced Google’s mapping application, which it had shipped with iPhones through the 4S model, with the company’s own application in iOS 6, which was released on Sept. 19. Users have complained that Apple Maps wasn’t accurate and contained errors. Apple on Monday referred to CEO Tim Cook’s apology on Sept. 28 in which he said the company was “extremely sorry” for bungling Maps. Cook said the application would improve with time as users reported problems. Until then, he advised users could use Microsoft’s Bing, Google Maps, Nokia’s Here, or Waze’s third-party app. Updated to correct the date of Tim Cook’s Maps letter.